Born in The Bahamas and driven by his purpose to inspire the best in others through their relationships, Kirk Johnson is a Man on a Mission. To know him is to understand his commitment to building people beginning with self-discovery. His work guides each person to understand and celebrate his or her own value, develop necessary life skills and in-turn empower those in their circle of influence. Kirk understands the value of teamwork and also knows that a chain is only as strong as its proverbial weakest link. So, each link in the chain, each person on the team, every individual in the family or community must be strengthened and involved to achieve true harmony, synergy and progress. Affectionately known as Cool it Kirk or Mr. Matters of the Heart, Kirk Johnson is a noted public speaker and consultant in communication and people development. 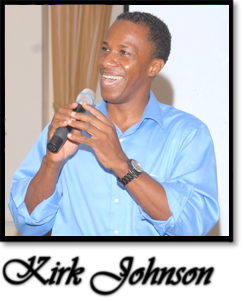 He is a healthy relationships educator, academic advisor and university instructor and a seasoned broadcaster with tenures at the Broadcasting Corporation of the Bahamas, GEMS New Media Network, Jones Communications and Guardian Talk Radio. Kirk is preparing to reengage in talk radio as the host of the shows he founded, Matters of the Heart® and The Things That Matter®. A certified youth leader certified by The Bahamas Ministry of Youth, Sports and Culture, Kirk is also an advanced communicator in Toastmasters International and a graduate of the Dr. Myles Munroe Leadership Mentorship Program. His community involvement includes his work as founder and president of The My Heart Matters Group and a volunteer healthy relationships educator with The Bahamas Crisis Center.�He enjoys acting and motorbikes and in 2016, will add author to his contributions. My name is Kirklyn Johnson or Cool it Kirk, a nick name I earned after a hard to forget ninth grade performance in high school. Although I always liked my stage name, I disliked "Kirklyn" because I thought of it as a girl's name. However, my time schooling and working abroad helped to broaden my perspective and to truly appreciate the unique value of my name. Did you know that Kirk means church? What does your name mean? So here I am, a man who finally likes his first name, moreover, who truly likes himself. I've come to understand that before you can truly love others you must first love yourself. Not selfishness but self-value. I was a popular DJ in high school yet I often felt alone. That had a lot to do with the way I looked at the world during that time in my life. For the most part I kept that to myself. Whether you’re a male or female, middle school or college student, 9 to 5 worker or stay at home mom or dad, we all need to be reminded that we are important and that someone really cares. Also, we must talk about what is going on inside to someone we trust, who cares and is able to provide sound advice or connect us to someone who could. The Matters of the Heart talk show began in 1996 as I struggled to get over a past relationship. At that time, she was my world and I was devastated when it came crashing in. I felt like life wasn't worth much and wondered if I would ever live a "normal" life again. Thankfully, with time, effort, support and lots of prayer, I learned how to let go of emotional baggage and get my heart back. I also learned about the importance of self-discovery, forgiveness, family and the wider community. I also learned that time alone is not enough to heal a broken heart. Time is like a canvass, it's what you paint on your canvas that truly makes the difference. Healing requires all the elements I mentioned earlier. Honestly, it is my relationship with CHRIST that gives my life a strong foundation. Today, I am elated to say that I got my heart back and do love again! More so, I have found my princess. She is my compliment, best friend and beautiful wife, Charlene. Then having healthy, fulfilling personal and professional relationships require no less, perhaps even more. Relationships develop in many forms but it starts with you. It starts within. Whether you�re in The Bahamas, Europe, the Caribbean, the United States, Africa, South America, Australia, China, India, the Middle East or another country in the world, YOU are uniquely important. NO ONE AND NOTHING CHANGES THAT FACT! My mission is to empower you so that you will in turn empower the good in the others around you. From my heart to yours, ALWAYS remember that Your Heart Matters."